Glare, heat, and damaging UV rays from the sun can limit the hours you can use and enjoy your patio, but Oasis 2700 Patio Sun Shades change all that! Fully retractable solar screen shades allow view-through to the outside while significantly reducing the bothersome effects of the sun on covered patios, pergolas and decks. Enjoy your outdoor living space to the fullest! Insolroll builds a better shade, from start to finish! Solar screen fabrics are woven to precise standards in order to control sun without blocking view-through. Fabric color and openness (tightness of the weave) determine how much light, heat and UV are allowed to pass through into the patio space; light colors provide better heat reduction and dark colors provide better glare reduction, while more loosely woven fabrics allow more view through and more tightly woven fabrics allow greater daytime privacy. Every fabric is laboratory-tested to determine precisely how much of the sun’s energy is reflected, absorbed, and allowed to pass through, and this data is available when selecting fabric. All fabric edges on the Oasis 2700 Patio Shade are welded, or heat sealed to prevent unsightly fraying of the edges. The two side edges of the fabric are secured by a cable guide system. 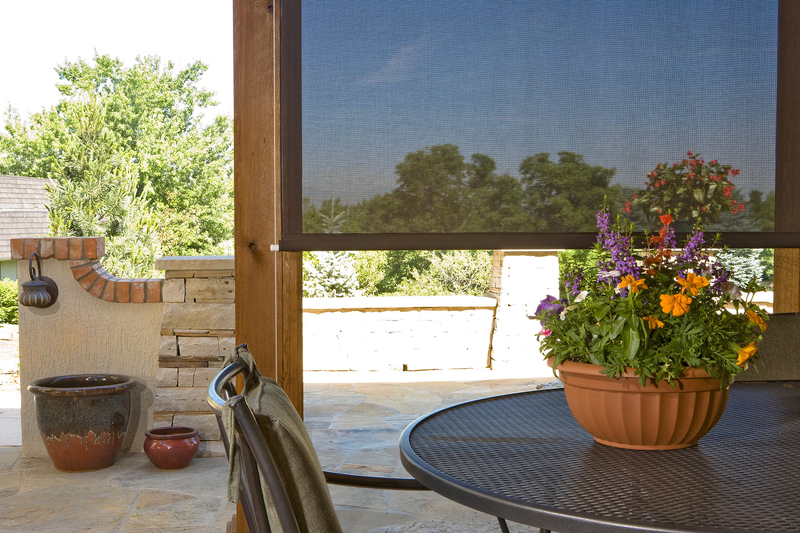 Oasis® 2700 Solar Screen Shades are engineered for smaller patio openings up to 11′ wide. For larger openings, see Oasis 2800. We can accommodate small openings as narrow as 31 3/8″ with a motorized shade. All Oasis 2700 shades are custom-made and feature a cable guide system to provide greater stability in a light breeze. A fully enclosed 4″ x 4 1/2″ extruded aluminum head box protects the fabric when retracted and provides a finished appearance. Shades are available with manual clutch or motorized operation. Fire-rated (FR) Aurora solar screen fabric consists of vinyl-coated polyester yarns woven in a 2 x 2 basketweave configuration. This value-priced fabric provides excellent view-through visibility. 27% Polyester, 73% PVC solar fabric in 3% and 5% openness choices. Click to view larger swatches. Vinyl-coated fiberglass solar screen fabric, Kona is woven in a basket weave configuration for excellent view-through. Vinyl-coated polyester insect screen with very small apertures to keep out very small insects such as No-See-Ums, or biting midges. 48% openness; click to view larger swatch. Heavy-duty vinyl-coated insect screen designed to keep out mosquitoes and other insects. Three times stronger than regular insect screens, it is pet-resistant, tear-resistant and puncture-resistant. 45% openness; click to view larger swatch. High tensile- and tear-strength acrylic translucent fabric for privacy, sun protection and resistance to rain. Click to view larger swatches. Exterior translucent fabric composed of high tenacity polyester with a PVC coating. 0% openness with no view-through, and a waterproof finish layer. Recyclable. Click to view larger swatches. Our Natural Weave Linen collection features FR solar screen fabrics woven with a slubbed texture and varied colors for a sophisticated, linen-like appearance. Made of polyester and vinyl, the fabric's 3% openness provides excellent outward visibility. Click to view larger swatches. Fire-rated (FR) solar screen fabric woven with diverse textures and rich colors for a natural shade appearance with superior durability, minimal maintenance and excellent outward view-through. In 5-10% openness, composition varies for each fabric. PVC coated polyester with additional acrylic or olefin yarns. Click to view larger swatches. FR solar screen fabric, Mesa is woven in a 2 x 2 basketweave pattern, available in wide widths and 7 stylish colors. With a composition of 37% fiberglass and 63% vinyl on fiberglass, each color is available in 4 densities: 1%, 3%, 5%, and 10%. Click to view larger swatches. Woven from thick, 165 Tex core yarns, Palisade solar fabric has added strength and durability for extra-wide patio shade applications. Weather-resistant, this premium fabric features basket weave pattern for optimal view-through. Clutch size is matched with shade sizes according to lifting capacity and shade weight. Insolroll’s exclusive Metal Select locking chain guide meets child safety standards and will not crack or degrade in the elements. Bead chain available in 4 colors. Insolroll is an industry leader in Child Safety. We have developed products that exceed the latest standards established by the American National Standard for Safety of Corded Window Covering Products (ANSI/WCMA A100.1-2012), effective June 1, 2013. Oasis 2700 also meets with the new ANSI/WCMA standard that will take effect on December 15, 2018. Operate your Oasis 2700 Patio Sun Shades with the touch of a button! Radio motors are the most common choice choice and make retrofit applications easy as the switching is all wireless. Shade control options by Somfy wireless wall switch, hand-held remote control, or even smart phones. Our heavy-duty 5-sided extruded head box both stores and protects your fabric, as well as conceals the roller. Heavy-duty mounting brackets are designed for lasting stability. The headbox and side tracks are available in 3 colors to complement any patio design or color scheme: White, Bronze and Tan. Insolroll’s cable guide system keeps fabric traveling straight as the shade is rolled up and down. It also provides greater stability of the shade fabric in breezy conditions.